Domestic chinchillas are quite common as pets, but many people are surprised to learn they are close to extinction in the wild. The Minnesota Zoo supports conservation efforts to improve chinchilla habitat and replant lost vegetation. Chinchillas wait until dusk to begin foraging. They prefer grass, but will eat any kind of available vegetation. These social rodents live in the arid rocky regions of the central Andes Mountains and coastal foothills. During the day, they seek shelter in rock crevices, under vegetation, or in burrows. Today there are only a handful of long-tailed chinchilla populations in Chile and a few short-tailed chinchilla populations remaining in Chile, Bolivia, and possibly Argentina. Chinchilla fur is so dense that it doesn’t dry easily when wet. To keep themselves clean, chinchillas take regular dust baths. Both species of chinchillas are endangered. In the past, chinchillas were hunted for their pelts, and some were captured for the pet trade. The small remaining populations of wild chinchillas continue to be threatened by habitat degradation and poaching. Chinchilla fur is incredibly soft, silky, and dense. While humans have one hair per follicle, chinchillas can have up to 50-60 hairs per follicle! The gestation period for a long-tailed chinchilla is 111 days and 118 days for a short-tailed chinchilla. This is relatively long for a small mammal. Offspring are well-developed at birth (fully-furred and with eyes open). This is presumably due to the long gestation. A litter of chinchillas contains 1-6 offspring, but two is average. A female can have up to two litters per year. Nearly every pet chinchilla in the United States is a descendent of wild chinchillas imported in the 1920s. Long-tailed chinchillas were thought to be extinct in the 1960s, but have since been rediscovered. Short-tailed chinchillas were presumed extinct and were rediscovered in the early 2000s. Chinchillas are popular pets, but they are endangered in the wild. In the past, chinchillas were hunted extensively for their pelts, and some were also captured for the pet trade. Today, long-tailed chinchillas are limited to very small areas of Chile. Remaining populations of short-tailed chinchillas are limited to small areas of Chile, Bolivia and possibly Argentina. Chinchillas are threatened by mining, habitat encroachment, and poaching. These species are also difficult to monitor and protect in the remote areas where they live. Urgent conservation actions include increasing the size of protected areas and habitat restoration. From 2010-2016, the Ulysses S. Seal Conservation Grant Program provided funds to replant vegetation and restore chinchilla habitat in the National Chinchilla Reserve near Illapel, Chile. This project is through “Save the Wild Chinchilla” and has been championed by Christine Ness, Zoomobile Interpretive Naturalist at the Minnesota Zoo. 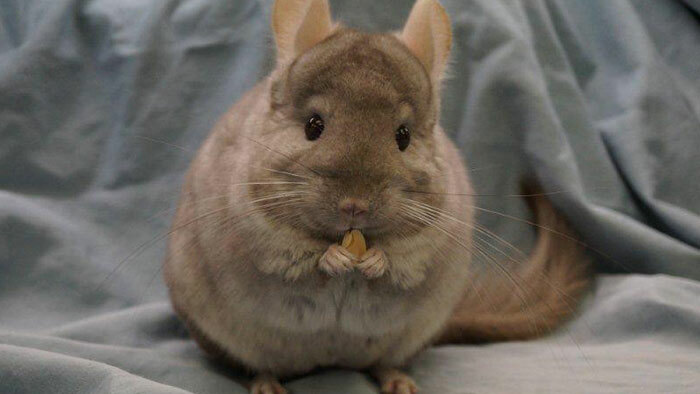 If you are considering a chinchilla as a pet, make sure it comes from a reputable domestic breeder. The Zoo’s population of domesticated chinchillas along the Tropics Trail and in Zoomobile programs serve as stand-ins for their endangered wild cousins.